Every so often I share my phone homescreen on this blog (here are some past homescreens.) I do this because I like to be able to reflect back and see what apps I once used, and also in the hopes that others would share their homescreens so I can see what I might be missing. So, please consider uploading a screenshot of your homepage in the comments, or just letting me know some your can’t-live-without apps! I use the Pixel 2, and I love having the Google Search Bar ever-present on the bottom of my phone. I use it all the time. This is the same as Apple’s Find Friends, only it works across both iOS and Android devices. Terrific free app to be able to share your location with your loved ones. I use this app all the time, mainly to access spreadsheets that help me manage Dragon Army. This is the app we use at Dragon Army for our security. It lets me use my phone to get into the building and the parking deck. These are the apps I use to keep myself organized (along with Google Calendar.) Here’s a breakdown. I pay for YouTube Premium (I think its like $10/month) to allow it to play in the background on my phone. I do this because YouTube has replaced podcasts and TV for me, almost entirely. And I like to listen to YouTube content while driving (if I’m not listening to an Audible book) and I need it to play in the background so I can see Google Maps navigation (and so I don’t get distracted by the video.) Most people subscribe to YouTube Premium because it doesn’t show ads, which is great, but I needed the ability to have it play in the background. Google recently updated their News app and its terrific. Great layout and its tailored to topics that I’m interested in. I do sometimes open up Flipboard, which used to be my go-to news app, but Google News has overtaken it for daily usage. We run our business on Slack at Dragon Army, and I have several other groups that I am a part of that use Slack to communicate. Here are 6 reasons why I love Slack. I’ve tried every mail app out there, and Google’s Gmail app beats them all IMHO. Google Inbox used to be a contender, but when Gmail recently added the Snooze functionality into it’s core features, it easily beats Inbox for me. 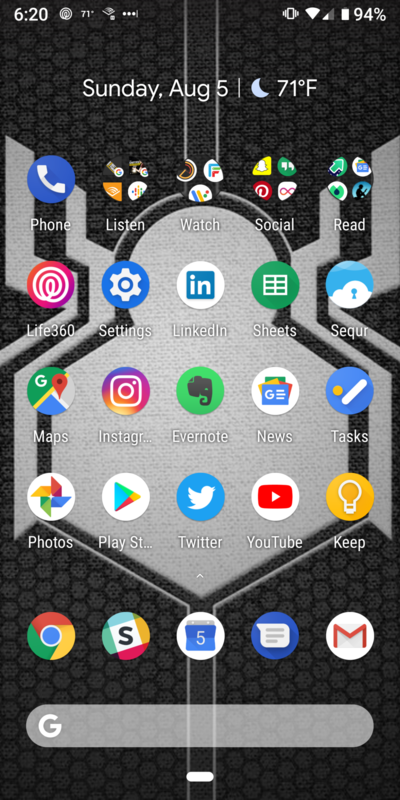 Ok, share YOUR homescreen or must-have apps!